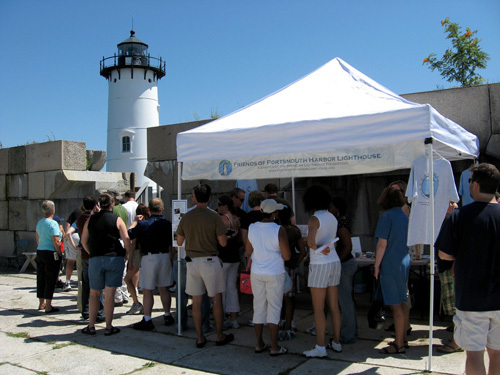 The Friends of Portsmouth Harbor Lighthouses host open houses every Sunday from late May until mid-October. Climb the 44 stairs & 7-rung lantern up to the lantern room where you can enjoy the magnificent ocean views that include Whaleback Lighthouse and Wood Island Life-Saving Station at the entrance to the Piscataqua River. Visitors also obtain elevated views of Fort Constitution, which is situated adjacent to the lighthouse, as well as the opportunity to admire the light’s working fourth-order Fresnel lens up close. Volunteers will share with you the history of the light station and answer your questions about this one one-a-kind maritime complex that is uniquely nestled between the shorelines of New Castle, NH and Kittery, ME. Tours at Portsmouth Harbor Lighthouse are on a first come-first served basis. A suggested donation to climb is $4 for adults and $2 for children 12 & under. No children under 42 inches tall are permitted to climb to the top, and adults are not permitted to carry children up the stairs. From Route 1B in New Castle, NH…. you’ll see signs for the Coast Guard Station Portsmouth Harbor and Fort Constitution. Follow these signs to the right. (Actually, from this direction, you’re going straight as Route 1B turns to the left). Follow to the parking area for Fort Constitution. Do not drive through the gate to the Coast Guard station. Walk through the gate to the station and follow the blue line to Fort Constitution. You can see the lighthouse from the fort. During open houses and pre-arranged tours, you are allowed to walk to the lighthouse.